I can’t attend my regular Slimming World group this week, because I have an appointment in the city centre later that evening. It would be too much travel for me to get home and attend my normal group, and then get back into the city. Luckily, when you’re a Slimming World member you can attend any group throughout the UK and Ireland. So if, like me, you can’t make it to your usual group, then you can attend any of the other groups listed on the Slimming World website. I’ve found one really near my office that happens to be on the same night as my usual group, so I’m planning to go there for my weigh-in. I don’t think I’ll have time to stay for the IMAGE therapy, but at least I won’t have to miss my weigh-in. Because all the membership details are computerised, you can present your Slimming World membership card at any group and be a visiting member. It even knows if you’re on a countdown. If you’re currently a Slimming World group member, and have been going for a while, you probably know the food optimising plan pretty well. And you may have considered the option of leaving the group, saving the money, and going it alone. Similarly if you’re a lapsed or former member, and you’ve let things go for a while, you might wonder if it’s possible to start back on the Slimming World plan without re-joining a group. Of course there’s always the online membership which still gives access to all the recipes and resources on the Slimming World website – and the monthly subscription is cheaper than going to a group. But even without having access to the Slimming World website any more, there are loads of recipes and advice available on other sites on the internet and social media. So can you go it alone? The answer is going to be down to individual circumstances, and to what extent the group helped you keep a momentum with your weight loss. If you are one of those people who most weeks weighs and leaves, and doesn’t stick around for the Image Therapy, then it might be arguable that you could just as easily weigh in at home on your own. But, of course, that requires a fair degree of self-discipline. On the other hand if you know that your weight loss suffers when you don’t stay for Image Therapy, then it’s probably a sign that you need to keep going to a group. The classes often provide motivation, helpful advice, and recipe ideas – and are clearly invaluable to some people. Personally, I know that if I stay for the image therapy then my weight loss the next week will be better. What if I don’t stay for image therapy? There’s a whole host of reasons why people don’t stay for image therapy: they’re too busy, tired or ill, have family commitments, have had a bad week, or just find the sessions torturous! And let’s face it, not every Slimming World consultant is inspirational and engaging. And if find that you weigh and leave more often than not, and you feel you have the strength and determination to keep food optimising on your own, then maybe you can go it alone. I’d like to hear about people’s personal experiences on this in the comments. Have you successfully followed the Slimming World plan without being a member? How did you do it? What advice would you give to others? It may seem silly getting excited about getting stickers on my book. After all, they probably cost a fraction of a cent to produce. But it’s not their monetary value. It’s what they represent. In Slimming World, every time you lose a half stone you get given a sticker and a certificate to mark the occasion. 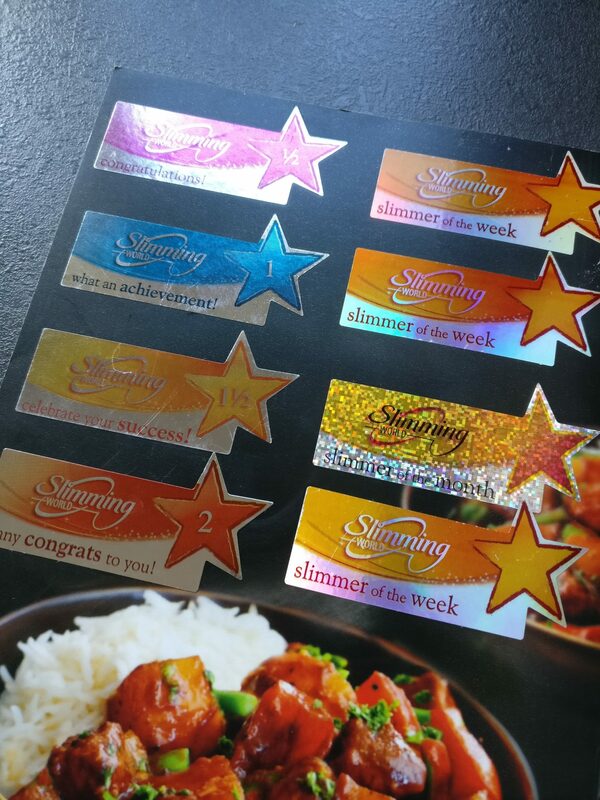 Stickers and certificates are also given out if you win any other award such as Slimmer of the Week, Slimmer of the Month, Woman/Man of the Year, Miss Slinky, Biggest Loser, and so on. As you can see, I’ve lost 2 stone so far, and have won Slimmer of the Week three times and Slimmer of the Month once. Very proud! Each time I get one of these awards I get strangely excited about the prospect of being able to add the sticker to my book. They’re a bit like trophies that I get to show off to the rest of the group – not that most of them care either way. But they’re also a good reminder to me when I’m sat at home during the week to stay strong and not be tempted to raid the fridge. Whenever I think about stuffing my face with chocolate, I remember that I’m aiming for my two and a half stone sticker, and I close the kitchen cupboard door and go and find a carrot to munch instead! It’s amazing that something so simple as a sticker can act as motivation for me to stick to the Food Optimising plan. In fact, I’m so proud of them, I even display them on the progress page of this website!